Located about 25 miles north of Budapest, Visegrad is a tiny castle town on the banks of the Danube River. It makes a nice day trip from Budapest, but is also worth a couple days in its own right, as it makes a great base for hiking and other adventure sports in the surrounding area. Visegrad was first mentioned in the history books more than 1,000 years ago and was a Roman stronghold in the time of Constantine the Great. The Turks destroyed most of the town in 1543, but it gradually rose again and regained town status in 2000. One of the most popular sites in Visegrad is the Royal Palace, originally built in the 14th century and reconstructed in a Renaissance style by King Matthias Corvinus in the 15th century. The palace felt into ruin after the Turkish occupation of Visegrad and eventually became completely buried. Excavations began in 1934 and today the reconstructed palace is open to the public and includes exhibits on its long history. The Citadel, or Upper Castle, was built by King Bela IV in the 13th century to defend against the Mongols and is also open to the public. The Solomon Tower, which is part of the Lower Castle, also dates to the 13th century and today is home to exhibits of Gothic and Renaissance artifacts discovered in Visegrad. Climbing the tower offers great views of the surrounding area. Visegrad is easily accessible from Budapest by bus, train and boat. Hydrofoils leave from Vigado ter in Pest and from Batthyany ter in Buda once a day between April and September and take about an hour. A cheaper (but less scenic) option is to take the train from the Nyugati train station to Nagymaros-Visegrad and then hop a five-minute ferry across the Danube to Visegrad. The train runs every hour and takes about 40-60 minutes. Finally, you might catch a bus from the Arpad hid bus station, which takes about 80 minutes, departing every 20-60 minutes. Travel back in time to the 15th-century on a 6- to 8-hour private tour to Szentendre. 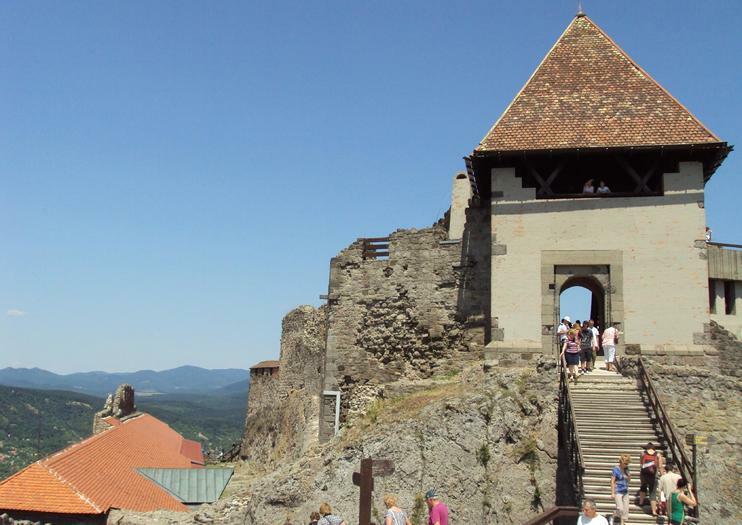 Private transportation carries you away from your Budapest hotel and along the Danube to Visegrad Fortress. Free from the constraints of a regimented group tour, you’re free to explore the fortress and charming streets of the Baroque Hungarian town independently and at your own pace. When you’re ready, unwind on the return journey to the city. Discover the highlights of the Danube Bend on a private tour from Budapest. Travel north to this scenic region, where the River Danube loops through hills, and visit historical Esztergom, Visegrád, and Szentendre. Admire Esztergom Basilica, visit the Royal Palace and Citadel at Visegrád, and explore Szentendre’s cobbled streets, baroque architecture, and arty shops. Includes lunch in Visegrád, an optional summer boat trip from Szentendre back to Budapest, plus private air-conditioned transport. For travelers with a few days in Budapest, it's easy to get wrapped up in the bustle of the city, and forget to explore the quaint towns nearby. Visit two lovely towns outside the city on this private day trip from Budapest. After hotel pickup, head to Szentendre and Visegrád to wander medieval streets, and see the Danube Bend from a scenic lookout. End your day with a stop at a museum, or some shopping—it's up to you. Your first stop takes you to the Esztergom Basilica—one of the largest churches in the world. Explore the adjacent treasury (optional), home to a rich ecclesiastical collection of gold and silver objects studded with sparkling jewels. We cross the river and the border to Slovakia to have the stunning view from the opposite side. Continue to Visegrád Castle and take in spectacular views of lush hills and the curve of the river. Sit back and relax in a local restaurant and feast on a 3-course Hungarian lunch before moving on. We stop at Solomon Tower, once the prison of Count Dracula.Arrive in the delightful baroque town of Szentendre. Walk the enchanting cobbled streets lined by art galleries, craft shops, and cafés. Return to central Budapest by a riverboat during the summer, or in the comfort of your luxury coach in winter. Enjoy a day trip from Budapest to the Danube Bend, a curve in the Danube River known for its natural beauty and surrounding historical attractions. Travel about an hour north of Budapest to Visegrad by private vehicle, letting your driver worry about navigating while you relax and admire the scenery. See royal landmarks, learn about the medieval history of the region, and visit towns like Esztergom, the former capital of Hungary, and Szentendre, known for its art galleries. View the Little Danube Bend and Hungarian towns from above on a private helicopter tour from Budapest. Follow the River Danube through Budapest before tracing its path through the charming towns of Szentendre and Visegrád, the latter nestled into the loop of the river called the Little Bend. Finally, gaze down over Esztergom, whose domed basilica overlooks the river. A glass of Champagne before your flight, and private round-trip hotel transfers are included.